I have recently started listening to a new podcast, What Are You Reading. In all of the episodes I’ve listened to so far the host, Matt Debenham, has asked his guest about what they read as a child. This got me thinking about my reading history and I thought it would be something interesting to share here. When I was very young I progressed from picture books to audio books (or story tapes as we called them then). I wasn’t a big reader at all, instead I would listen to one side of a tape before I fell asleep at night. My favourites were the Asterix books (read by Willie Rushton), later I moved on to some classics; Little Women, Anne of Green Gables and The Little Princess (read by Maureen Lipman). I get easily hooked on things and this is the reason I rarely read standalone books. I much prefer series or at least books with a recurring central character. When I think about it now, this started when I was a kid first with the Hardy Boys (I clearly remember the distinctive covers) and later V.I Warshawski (I read all the available titles in the school library). Here clearly also began my love of crime fiction. The other recurring theme in the books I read as a child was the ancient world and specifically the Roman Empire. I have recently re-read a childhood favourite, The Eagle of the Ninth by Rosemary Sutcliff. It is still fantastic and I would recommend it to children and adults in equal measure. Somewhere along the way I also dabled with vampires (didn’t we all?) reading Christopher Pike’s The Last Vampire series. I have a very vivid memory of finishing the last in the series on a plane! Today I discovered that three more books have been added to the series since then. Don’t think I’ll be going back for them. What happened next? Well nothing much really. I’m still reading lots of historical fiction (mostly set in the Roman Empire) and detective novels (they’ve got a bit darker though). I’ve always thought I was a slow reader so when I saw this speed reading test I wanted to see if my suspicions were confirmed. 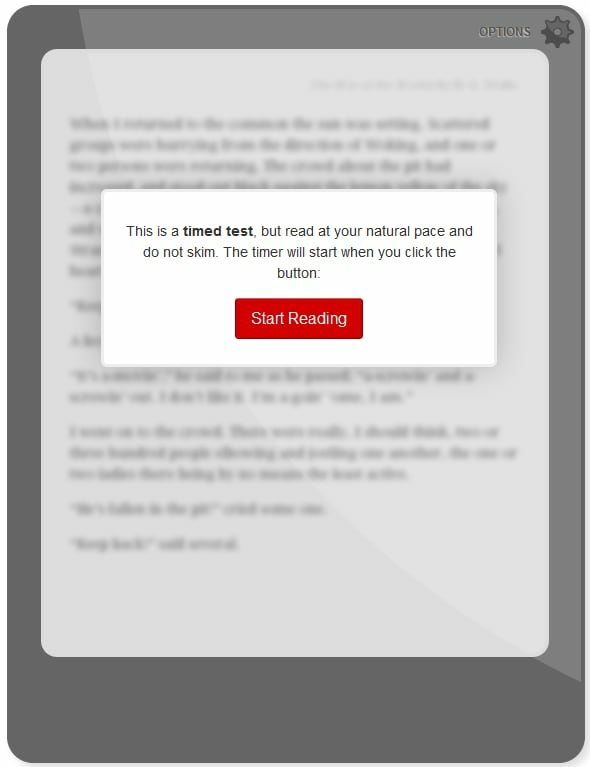 The test, created by Staples, times how long it takes you to read one page of text from an ebook. To check how much you’ve actually read it asks you a couple of questions about the content. And then it calculates your score. I read 186 words in 44 seconds and this gave me a score of 254 words per minute (wpm). To put your score in context you are provided with some other examples. On the scale my score was bang on the average reading speed of a student in 8th grade (year 9)! The average adult reads 300 wpm and the world speed reading champion is somewhere around 4000. Over Christmas I downloaded a free ebook of Jo Nesbo’s The Redbreast from the iTunes 12 Days of Christmas app. I thought this would be the perfect opportunity for me to try out ebooks with something I wanted to read anyway and at no cost. Capacity – we are already overflowing our bookshelves, despite a determined effort to weed our collection and decision to borrow rather than buy books. Converting to ebooks would offer a solution to this. Pagination- I really like the feature in iBooks that tells you how many pages there are left in the chapter. It makes deciding whether to continue reading or go to sleep so much easier. Page turning – I like that with iBooks Apple have tried to keep the authentic page turning effect, as demonstrated in the picture above. Distraction – I am easily distracted and I found having my reading book on my iPad meant that I messed about on the Internet for a while before settling down to read. This limited the amount of time I spent on the book in an average day. Disunity – my usual reading time is before I go to sleep, and in the bedroom we have an unwritten rule about using mobile devices. After I finished the ebook my wife confessed to me that having me in bed with my iPad felt odd because it wasn’t entirely clear what I was doing. Whereas when we usually read side-by-side there’s a sense of unity. 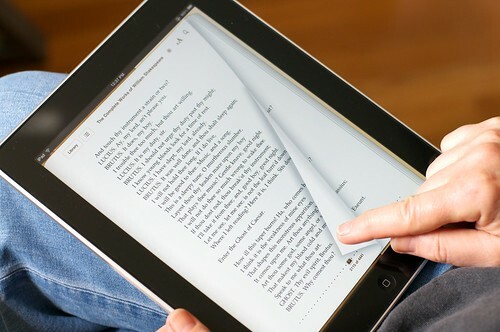 Discomfort – reading on the iPad just wasn’t as comfortable as reading a print book. I often found I couldn’t get into a comfortable position where I could rest my iPad and turn the pages. So in number my pros and cons are equal but when looking back on the experience overall I’d say that it was a little underwhelming. Looking at my cons they all appear to relate to the act of reading itself, whereas the pros are largely about functionality. Reading for me is about the full experience, the act of reading a book is as important as the book’s content. So for the moment I’ll be sticking with print, but won’t rule out giving ebooks another go in the future.